"Download With an External Download Manager" extensions can be used to interrupt browser's downloading jobs by redirecting these jobs to an external download manager like Internet Download Manager (IDM). Note that by default, all these tools are in the disabled mode meaning that there is no observer for downloads and hence there is no interruption. Whenever you have decided to send a job to an external download manager, first make sure to enable the extension by using the toolbar button and then follow the usual downloading process. You will notice that the external executable gets called instead of the built-in download manager. What external download managers are supported? What is "Download with Internet Download Manager (IDM)" extension and how does it work? This extension can be used to send downloading jobs to IDM download manager. 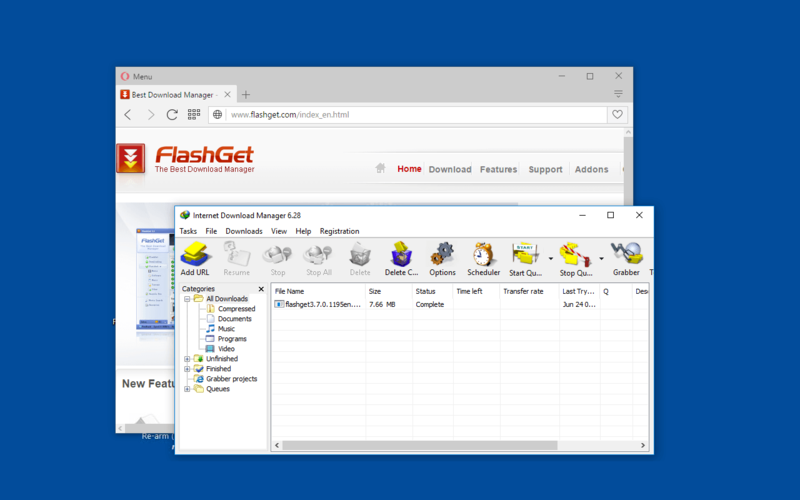 IDM is one of the fastest download manager available for Windows OS. To initiate a download with IDM, enable the extension from toolbar button and then follow the usual download process. Download link will be sent to IDM once it is resolved by your browser. Note that for this extension to send links to an external executable, you will need to install a minimal native client. This native client is required for communication with operating system. What is "Download with JDownloader" extension and how does it work? JDownloader is a cross-platform Java-based download manager. This extension integrates this downloader to your browser. Like other Download with X extensions, there are two modes of operation. 1) Aggressive: click on the toolbar button to enable the download observer and proceed as normal to download files. Once the browser initiates a download, it will get canceled out and resolved link will be sent to JDownloader. 2) Normal mode: there is a right-click context menu over links. This item can be used to send the link to the downloader. In the second method, the external download manager will be responsible for resolving the actual downloading link. Note: this extension uses HTTP protocol to send download links to JDownloader application. Make sure http://127.0.0.1:9666/ is accessible. Note: JDownloader supports cookies. By default the extension does not allow cookie access to JDownloader. If the downloading server requires cookies along with the URL to allow downloads, enable the option in the options page. What is "Download with Download Accelerator Plus (DAP)" extension and how does it work? This extension redirects downloading jobs to the well-known DAP download manager. Like other Download with extensions, there are two methods to send downloads to DAP. Either use the right-click context menu (recommended method as it is not aggressive) or activate the toolbar button. Note: DAP uses HTTP server to communicate with other application. For DAP to be able to receive messages from other executables, 10029 port is used. Make sure http://127.0.0.1:10029 is accessible. Note: This extension is only a connector that redirects downloads to DAP. It is not the actual executable. You need to have DAP download manager in your OS in order for the extension to operate. What is "Download with Wget" extension and how does it work? Wget is a command-line powerful download manager. This extension redirects all your downloads to Wget if it is activated from the toolbar button, or you can selectively send downloading jobs to Wget from the right-click context-menu. Note that Wget supports cookies. If you want to allow the extension to pass cookies to Wget, check the option in the options page. Note: Wget is a command-line downloader. This extension opens a new terminal and then starts Wget downloader so that progress can be monitored by the user. Based on your operating system, different terminal applications are used. For instance, on Windows OS, cmd.exe is used. You can change this terminal from the options page. What is the difference between sending jobs from right-click context menu and activating the toolbar button? When a job is sent from right-click context menu, only link and referrer is sent to the download manager (cookies as well if supported by download manager), while sending jobs if toolbar button is activated, waits for the browser to resolve the final URL and filename and then downloading job is paused and the resolved URL, as well as referrer and cookies are sent to the external download manager. Although the second method is more reliable, still the first method is recommended as it is less aggressive. If starting a job from right-click context menu is not working, activate the toolbar button temporarily and proceed as normal to send the job to the external download manager. Once the job is submitted, turn the toolbar button off again. What is the native client and why do I need it? By default, browser extensions are limited to the browser itself and have no access to system level APIs. However, to send download requests to an external executable, there is a need to communicate with an external executable. Normally this is done by having a small native client that knows browser communication language. Commands can be sent to any executable through this intermediate (bridge) application. For these set of extensions, I am using a minimal NodeJS native client. It is originally forked from Andy's native client implementation, though the version is modified by OpenStyles team. The OpenStyles version requires permission for each internal code access. External download managers usually have their own browser integration. These integrator extensions are usually too aggressive. That means they redirect all your downloads and there is no easy way to temporarily disable them. However, "Download with X" add-ons offer per user request integration. This way you can disable the integration while downloading small-size files and turn it on only when you really want to. Besides, note that "Download with X" extensions use a non-persistent background which means they do not use any resource while they are inactive. How can I use a "Download with X" extension? Once the native client is installed, click on the “Check Connection” button to make sure native integration works fine. Note that there are two ways to send your downloads to the external download manager. 1) Right click on a click and select the context menu. 2) Turn the toolbar button on and start a download by left-clicking over it as usual. Once link gets resolved, before browser starting the download, it gets canceled out and your external download manager gets called with the proper resolved link. I noticed chrome goes straight to the save and does not save in the browser but Firefox starts the save in the browser as well as with the extension. Why? Firefox browser still does not support downloads.onDeterminingFilename API. When this API is supported, the download behavior would be equal to the Chrome one. For now, it is recommended to use the right-click context menu item to send download jobs to the external download manager.